When Maddy mistakenly opens a time window where and when she shouldn’t have, Liam is marooned sixty-five million years ago in the hunting ground of a deadly—and until now—undiscovered species of predator. Can Liam make contact with Maddy and Sal before he’s torn to pieces by dinosaurs—and without endangering history so much that the world is overtaken by a terrifying new reality? Liam and Becks go forward in time to save Edward Chan after receiving a message from other Time Riders. An accident causes the group to be sent back 65 million years, where they are stalked by intelligent dinosaurs. These dinosaurs start to pick up things from the humans, which causes the present day (2001) to revert back into a jungle, since humans never evolved. Liam and Becks get a message back to Maddy and Sal, which causes the government to get involved. Maddy finally finds out where Liam is, and sends a portal to retrieve him. They fix the timeline, get rid of the government officials, and everything is great. Then Maddy finds Foster in Central Park and he tells her that he’s Liam. Liam and Maddy go back in time to the day before the San Francisco earthquake of 1906. They need supplies for the new support units. They go to a bank, where there is a box, and Maddy finds a mysterious note. The gang grows new support units back home in 2001. They receive a message from the future, telling them to save a guy called Chan, who has a hand in inventing time travel. They assume it’s a message from fellow Time Riders, but some parts of it are scrambled. They set about helping Chan. Liam and Bob – who is now female and called Becks – go to 2015, where Chan’s class is on a school trip. A guy called Howard came from the future to kill Chan. 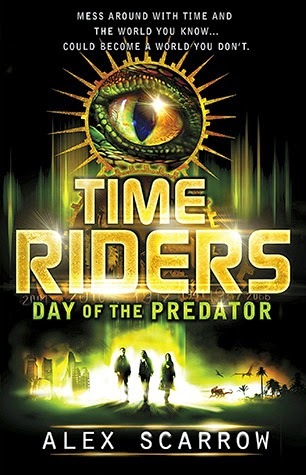 Maddy and Sal panic when they don’t get a reading on Liam, and by trying to find out where he and Becks are, they end up sending them and the entire school class back in time to 65 million years ago. Although they don’t know this and they assume they’ve killed everyone. The class “landed” on an island surrounded by rushing water on each side. Liam and Becks become leaders of the group. Smart dinosaurs start to stalk them. Liam comes across an animal corpse that has clearly been eaten by a predator. Becks attempts to kill Laura because she’s compromising the mission, but Liam tells her not to. Becks listens. Liam tells Becks that if the mission takes six months, she may terminate everybody to prevent them from contaminating the future. Liam and Becks have to get a message to Maddy, so they split the group and go on a hike. The group goes to where Dinosaur Valley will one day be, and Liam carves a coded message on stone. They do several copies in case some get destroyed, and then bury the slabs. Now they start to get picked off one by one by the smart dinosaurs, which have learnt how to mimic voices. Howard tells Chan that he was sent back in time to kill him. Chan isn’t angry. Liam and Becks and the few people who are still alive go back to the island. Back in the future, a government agency knocks on Maddy and Sal’s door. In 1941, two boys found one of Liam’s messages, and the government has had a secret department for time travel ever since. The men kidnap Maddy and Sal, but Maddy had told Bob to erase everything from the database if the girls weren’t back in six hours. So the government officials (Cartwright and Forby) take them back to HQ. While they’re there, they experience a huge time-wave which turns New York into a tropical jungle. They see the smart dinosaurs that are currently stalking Liam and Becks. They study the message from the clay tablet, and Bob sends density probes back. After nine hours, Maddy selects a probe, and sends a portal back in time for Liam and Becks. Liam realises that the smart dinosaurs learnt from the group of humans and built their own bridge. Whitmore and Howard are killed by the dinosaurs. The latter was killed whilst saving Chan. Becks kills a bunch of the dinosaurs, and then Liam, Becks, Edward and Laura all manage to get through the portal. Two dinosaurs follow them. Forby kills one before being killed himself. Maddy kills the second one. Becks heals, and then goes back in time to kill the rest of the dinosaur pack to prevent them from breeding. Now mostly everything should be back to the way it was. Maddy sends Liam back to 1941 to make sure the boys don’t find the message that he sent for Maddy and Sal. Now that that is fixed, Forby turns up alive. Cartwright tells Maddy that he wants to use the time machine to travel all over the place. He refuses to go outside of HQ so things can be fixed. A portal opens in HQ and Cartwright is dragged into chaos space. Liam comes through. Edward and Laura go outside, which corrects everything and they’re back in 2015 as though nothing ever happened. Observer: Sal’s job. She is the one to first spot a change in the timeline by getting to know her surroundings and noticing anything that’s out of place. Analyst: Maddy’s job. She takes charge of the computer system. Agent: Liam’s job. He is the one to travel in time and fix any contamination that may have occurred. Seekers: Creatures that live in chaos space.